Geisha Leopard is fast and aggressive as the name would suggest. Ride the slopes with this eye catching snowboard built using the best technologies and materials. Thanks to its double rocker shape, it is great for free-riding as well as for freestyle. Good for any kind of riders and great for the most demanding snowboarders. It feels very light due to the honeycomb technology and the precision of the double carbon system. 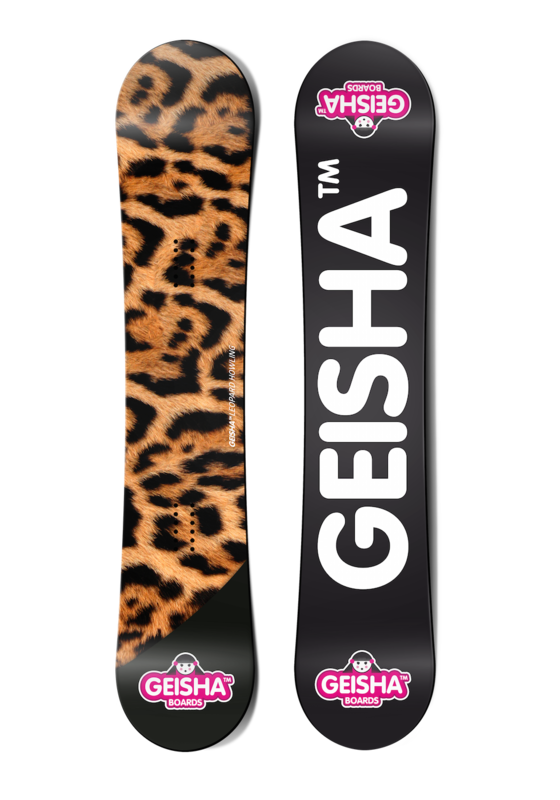 With the Geisha Leopard you will have maximum control over mountain terrain. Available in 140cm, 145cm and 150cm Medium flex. All our boards use this top quality base from Germany. There is no better base for this kind of snowboards. You will enjoy their speed and scratch proof capabilities. We use Biaxial Fiber on top part of the sandwich and Triaxial Fiber in the bottom in all our boards. This technology brings you better durability and smoother torsion for radical jibes control. Dual Carbon is the PROs choice. Together with Geisha Honeycomb Technology brings the extra precision in all situations, extra flex reaction and more durability for extreme jump landings. Our hybrid design (camber - rocker - camber) is probably the best bend ever created for a snowboard. It offers you the best of all worlds. Speed, control and easy riding. Perfect for beginners, made for PROs.